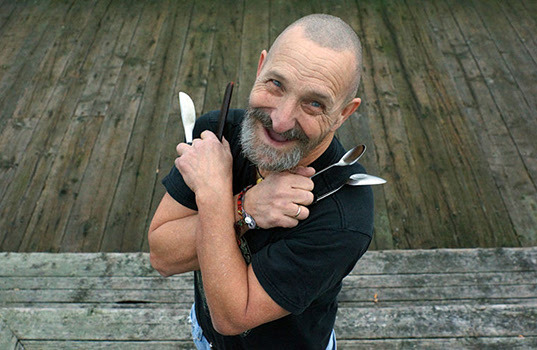 STG Presents Artis the Spoonman: 70th Birthday Celebration at The Neptune on Wednesday, October 3, 2018. Tickets are on sale for $15 and can be found here. Featuring performances by Artis the Spoonman, Jim Page, Baby Gramps, Jason Webley, Amy Denio, Steve Fisk, Jessica Lurie, Nanda, Mark Ettinger and many more to be announced. For nearly fifty decades, Artis has enthralled crowds at the Pike Place Market – his spoons moving faster than the eye can track and his entire body transformed like someone possessed by a musical demon. He is a regular performer at the Northwest Folklife Festival, the Oregon Country Fair, and in his current home of Port Townsend, playing both solo and with collaborators such as acclaimed songwriter Jim Page. In addition to his unparalleled spoon playing, Artis is a poet, an activist, a public speaker and a composer. In 1994 he was immortalized by Chris Cornell as the namesake and inspiration behind Soundgarden’s Grammy award winning song “Spoonman”. He recorded with the band on the studio recording and is featured in the song’s official video. Tickets are on sale for $15 and can be found here.